This protocol describes a semi-automated approach to produce hepatocyte-like cells from human pluripotent stem cells in a 96 well plate format. This process is rapid and cost-effective, allowing the production of quality assured batches of hepatocyte-like cells for basic and applied human research. Human pluripotent stem cells represent a renewable source of human tissue. Our research is focused on generating human liver tissue from human embryonic stem cells (hESCs) and induced pluripotent stem cells (iPSCs). Current differentiation procedures generate human hepatocyte-like cells (HLCs) displaying a mixture of fetal and adult traits. To improve cell phenotype, we have fully defined our differentiation procedure and the cell niche, resulting in the generation of cell populations which display improved gene expression and function. While these studies mark progress, the ability to generate large quantities of multi well plates for screening has been limited by labour intensive procedures and batch to batch variation. To tackle this issue, we have developed a semi-automated platform to differentiate pluripotent stem cells into HLCs. Stem cell seeding and differentiation were performed using liquid handling and automatic pipetting systems in 96-well plate format. Following the differentiation, cell phenotype was analyzed using automated microscopy and a multi well luminometer. Primary human hepatocytes (PHHs) represent the current standard for liver biomedical research. Despite their advantages, PHHs represent a limited source of mature hepatocytes with unstable phenotype1. Human embryonic stem cells (ESCs) and human induced pluripotent stem cells (iPSC) have been proposed as a powerful resource for biomedical research, promising a renewable source of human tissue, including liver2,3,4. Current hepatocyte differentiation procedures generate cells that express hepatocyte markers, genes and functions similar to PHHs3,4,5,6,7,8,9,10,11. More recently, the use of defined materials and matrices such as recombinant laminins, has improved cell phenotype and experimental reproducibility5,12,13,14. Traditional cell culture techniques rely heavily on manual pipetting, which is both time consuming and error prone. This limits the throughput of the assay and the plate format one can work with. To date, most studies describing the generation of HLCs are labor intensive in nature and therefore small scale in size15,16,17. Current advances in liquid handling and pipetting systems, in combination with automated microscopy and laboratory analysers, have made it possible to develop procedures which minimize the requirement for human intervention. We have taken advantage of these technologies and developed a semi-automated differentiation system with which to generate large quantities of human liver tissue for basic and applied biomedical research. This approach can be performed with both human ESC and iPSC lines with minor adjustments necessary, depending on the cell line. Combining this system with high content analysis, we demonstrate that HLC phenotyping can be less time consuming and performed at scale18,19,20,21. In summary, the automation of cell culture techniques described herein has led to improvements in reliability, experimental time management and assay throughput. NOTE: Reagents and equipment used in this protocol has been listed in Table 1. Media used for this experiment must be sterile and at room temperature for cell culture. All reagent/solution volumes described in this part of the protocol are based on a single well of a 96-well plate unless otherwise specified. Prepare laminin coated 96 well plates. Thaw a vial of recombinant laminin 521 (100 µg/mL) (LN-521) for 2 h to overnight at 4 °C. Prepare a 5 µg/mL solution by diluting LN-521 in ice-cold 1x Dulbecco's phosphate-buffered saline (DPBS) (with Ca2+/Mg2+). Use an automatic liquid handling dispenser with a standard tube dispensing cassette to add 50 µL of the LN-521 solution per well of a 96 well plate. NOTE: All volume dispenses are performed with an automatic liquid handling dispenser with a standard tube dispensing cassette unless otherwise specified. Prime the solution until it reaches the dispensing end of the cassette, then proceed to dispense. Multiple 96 well plates can be prepared in the same experiment by repeating the procedure as many times as needed. Incubate the LN521-coated plates at 37 °C/5% CO2 for 2 to 4 h.
NOTE: LN521-coated plates can be stored up to two weeks at 4 °C. Keep the plates sealed on a flat surface to avoid evaporation and contamination. Warm up the required number of pre-coated plates at 37 °C for 30 min to 1 h.
Aspirate the remaining LN-521 solution of the coated surface using an 8-channel aspiration adapter. NOTE: It is critical to avoid any contact with the coated surface to avoid coating degradation. Immediately add 50 µL per well of mTeSR1 medium supplemented with 10 µM Rho-associated kinase (ROCK) inhibitor Y27632 and keep the plate in the incubator until cell seeding at 37 °C/5% CO2. NOTE: Do not allow the laminin-coated wells to dry. Prepare a cell suspension of 3 x 105 cells/mL in mTeSR1 medium supplemented with 10 µM ROCK inhibitor Y27632. NOTE: The seeding density for each cell line will require optimization. Aspirate the medium from a Petri dish with an undifferentiated culture of hPSCs at about 75% to 85% confluency cultured on LN-521 as previously described12. NOTE: hPSCs are cultured on LN-521 in mTSER1 with the medium changed every 24 h, and passaged regularly once the cells reach 80% of confluency as previously described12. Wash the cells with 5 mL of room temperature 1x DPBS (without Ca2+/Mg2+) and aspirate the buffer. Add 5 mL of 1x Gentle Cell Dissociation Reagent to the cells and incubate at 37 °C for 6 to 8 min for cell dissociation. NOTE: To stop the reaction, examine the detachment of the cells from the matrix under the microscope. The cells should be partially detached from the plate. If not, extend the incubation for an extra 1 to 2 min. Terminate the reaction by aspirating the Gentle Cell Dissociation reagent and add 5 mL of fresh mTeSR1 medium supplemented with 10 µM ROCK inhibitor Y27632 to the cells. Use a cell scraper to lift the cells from the matrix and pipette up and down using a P1000 tip several times to mix. Count the viable cells using a hemocytometer based on Trypan Blue staining exclusion method and prepare the cell suspension with required concentrations. Pipette the desired number of the cells into a sterile 15 mL or 50 mL centrifuge tube and spin the cells down by centrifuging them at 115 x g for 5 min at room temperature. NOTE: For one 96 well plate, 5 mL of mTeSR1 medium containing 3 x 105 cells/mL is required for the H9 cell line. Aspirate the supernatant and gently resuspend the cell pellet until a homogenous solution is obtained at 37 °C in mTeSR1 medium supplemented with 10 µM ROCK inhibitor Y27632. NOTE: The use of ROCK inhibitor is recommended as it improves cell survival post re-plating. Add 50 µL of the cell suspension onto the 96 well plate containing 50 µL of mTeSR1 with 10 µM ROCK inhibitor Y27632. After seeding, return the plates to the cell incubator at 37 °C/5% CO2 for 24 h to allow the cells to attach. Examine the cells the next day and withdraw ROCK inhibitor once the cell to cell contact has been established. At 40% confluency, switch to differentiation medium (Figure 1B). NOTE: If cell confluency is higher than 40%, the plates are not suitable for HLC differentiation with the H9 cell line. Prepare the differentiation medium and growth factors. Prepare human Activin A stock solution (100 µg/mL) by dissolving human Activin A powder in sterile 0.2% bovine serum albumin (BSA) in PBS. Aliquot the stock and store at -20 °C. Use at 1:1,000. Prepare mouse Wnt3a stock solution (10 µg/mL) by dissolving mouse Wnt3a powder in sterile 0.2% BSA. Aliquot the stock and store at -20 °C. Use at 1:200. Prepare human hepatocyte growth factor (HGF) stock solution (10 µg/mL) by dissolving human HGF powder in sterile 0.2% BSA. Aliquot the stock and store at -20 °C. Use at 1:1000. Prepare Oncostatin M (OSM) stock solution (20 µg/mL) by dissolving the powder in sterile 0.2% BSA. Aliquot the stock and store at -20 °C. Use at 1:1,000. Definitive endoderm: Prepare endoderm differentiation medium, consisting of 2% B27 supplement (50x, without insulin), 1% penicillin/streptomycin (final concentrations: 100 IU/mL and 100 µg/mL, respectively) added to Roswell Park Memorial Institute 1640 (RPMI 1640) basal medium. Store at 4 °C and use within two weeks. At each medium change, supplement the required volume with Activin A and Wnt3a at final concentration of 100 ng/mL and 50 ng/mL, respectively. Hepatoblast differentiation: Prepare hepatoblast differentiation medium, consisting of 20% knockout serum replacement (KSR), 0.5% an alternative supplement to L-glutamine, 1% non-essential amino acids (NEAA), 0.1 mM beta-mercaptoethanol, 1% DMSO, and 1% penicillin/streptomycin (final concentrations at 100 IU/mL and 100 µg/mL, respectively) added to knockout DMEM (KO-DMEM). Filter under vacuum and store at 4 °C. Use within two weeks. Hepatocyte differentiation: Prepare hepatocyte differentiation medium, consisting of 1% an alternative supplement to L-glutamine, 10 µM hydrocortisone 21-hemisuccinate sodium salt (HCC), 1% penicillin/streptomycin (final concentrations at 100 IU/mL and 100 µg/mL, respectively) added to HepatoZYME medium. Store the stock at 4 °C and use within two weeks. For each medium change, supplement the required volume with HGF and OSM (final concentrations at 10 ng/mL and 20 ng/mL, respectively). 24 h post seeding, carefully remove the medium using an automatic hand-held electronic channel pipette system and add 100 µL of fresh endoderm-priming medium supplemented with 100 ng/mL Activin A and 50 ng/mL Wnt3a. NOTE: The differentiation process commences once the definitive endoderm medium has been added. Once cell seeding is optimized, the cellular differentiation is normally initiated within 24 h. All medium changes are performed by removing the medium with an automatic hand-held electronic channel pipette system and dispensing 100 µL of fresh medium using an automatic liquid handling dispenser with a standard tube dispensing cassette unless otherwise specified. An automatic hand-held electronic channel pipette system was used with a 96 well head, using 300 µL tips. In brief, 90 µL were aspirated from the well avoiding any contact with the cells, and it is important to not dry the cells during medium change to reduce cell stress. For human embryonic stem cells (hESCs), change the endoderm differentiation medium daily for three days. 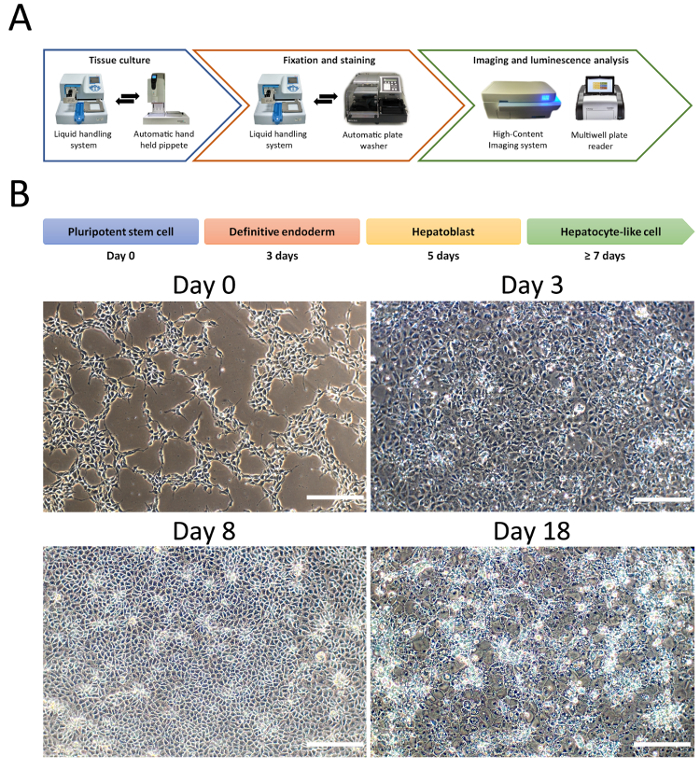 If the differentiation is performed for human induced pluripotent stem cells (hiPSCs), extend the definitive endoderm stage for 2 extra days using Activin A only. After definitive endoderm induction, switch to KSR/DMSO medium for hepatoblast specification, and change the medium every 2 days for 5 days. NOTE: If there are a number of non-attached cells in the well, use non-supplemented KO-DMEM to wash the cells once before the next medium change. Due to the duration of the second stage of the protocol (5 days), there will be 3 medium changes with the last one on the last day of the hepatoblast specification. Following the hepatoblast differentiation, switch to HepatoZYME medium for hepatocyte maturation. Wash the cells once with HepatoZYME without the supplement after removing KSR/DMSO medium and add 100 µL of HepatoZYME maturation medium supplemented with 10 ng/mL HGF and 20 ng/mL OSM. Change the medium every 48 h for 7 to 10 days. At day 18 of the differentiation, characterize HLCs by analyzing the gene expression and CYP P450 metabolic activity. Detect the expression of hepatocyte-specific markers and polarization markers using immunostaining. Test hepatocyte metabolic function using CYP P450 assays as described before12. Determine the plate variation, counting the total number of cells per well per plate. On day 18 of differentiation, wash the wells three times with 1x DPBS, fix the HLCs by dispensing 50 µL of 4% paraformaldehyde (PFA), and incubate at room temperature for 15 to 30 min. After the fixation, wash three times with PBST (0.1% tween) (without Ca2+/Mg2+) using an automatic plate washer. NOTE: All washes in this section are performed using an automatic plate washer unless otherwise specified. All washes are done following the same protocol. Permeabilize the membrane by dispensing 100 µL of PBST (without Ca2+/Mg2+) and incubate for 20 min at room temperature. Next, perform the protein blocking by dispensing 100 µL of 10% BSA in PBST and incubate for 1 h in gentle shaking using a plate shaker. After protein blocking, add 50 µL of 1% BSA in PBST containing the primary antibodies, incubate at 4 °C overnight with gentle shaking using a plate shaker. NOTE: Do not wash between protein block and antibody addition. After 24 h, wash three times with 1x DPBS (without Ca2+/Mg2+) and add the secondary antibody by dispensing 50 µL of 1% BSA in PBST. Incubate 1 h at room temperature in the dark. After the secondary antibody incubation, wash 3 times with 1x DPBS. Add 50 µL of DPBS with DAPI (10 µg/mL) and incubate for 5–10 min at room temperature in the dark. Finally, wash 3 times with DPBS and leave 100 µL of 1x DPBS in the well. Plates are ready for imaging. NOTE: Plates should be stored at 4 °C in the dark until imaging. Image the plate by using a high-content imaging system, and acquire several fields across the well to obtain a good representation of the well. Quantify the expression of the different markers in the HLCs by using Columbus software (High-Content Imaging analysis system software). NOTE: Columbus is a high content analysis software, which offers cell segmentation analysis for cell phenotyping. Similar results can be achieved by using CellProfiler, an open-source software for quantitative analysis of biological images22. Cell differentiation was performed using an embryonic stem cell line (H9). The semi-automated platform was used to differentiate and characterize the cells (Figure 1A). An automatic liquid handling dispenser was used to coat matrix and seed single cells. Cellular differentiation was initiated when the cells reached 40% confluency (Day 0). Media changes were performed using an automatic hand-held electronic channel pipette system to remove medium and the liquid handling dispenser for medium addition (Figure 1A). Cell fixation and staining were performed using the automatic liquid handling dispenser in combination with the automatic plate washer. Imaging and quantification were performed by using a high-content imaging system and Columbus software. Cytochrome P450 activity was measured using an established assay. Following substrate incubation, cell supernatants were harvested, and bioluminescence recorded using a multimode microplate reader (Figure 1A). In addition, conventional phase contrast microscopy was used to measure the changes in cell morphology during hepatocyte differentiation (Figure 1B). On Day 18, the variability in cell number between wells was examined following DAPI staining (Figure 2A). Seven fields of view were captured per well and the number of nuclei quantified (Figure 2A). We detected no statistical differences between wells with an average of 41,662 ±3,366 cells per well (Figure 2B). At day 18, HLCs were fixed and stained for typical hepatocyte markers (Figure 3A-G) and tested for CYP P450 activity. HLCs expressed hepatocyte markers such as HNF4α (89.2% ±2 positive cells), ALB (92.8% ±6 positive cells), AFP (61.8% ±2 positive cells). HLCs also expressed CYP P450 proteins, CYP2D6 and CYP3A4 and displayed a distinct polygonal appearance as shown by E-Cadherin protein expression. HLCs CYP P450 activity was measured at day 18. HLCs exhibited CYP1A2 activity at 295,906 ±45,828 RLU/mL/mg of protein and CYP3A at 1,066,112 ±177,416 RLU/mL/mg of protein (Figure 3H). Figure 1: Hepatocyte differentiation from PSCs in the 96 well format. (A). Diagram of the equipment used to semi-automate cellular differentiation, fixation, staining, imaging and functional activity. (B). Representative changes in cellular morphology during HLC differentiation. Briefly, PSCs are primed toward definitive endoderm, followed by hepatoblast specification characterized by cells displaying cobblestone-like morphology and prior to hepatocyte maturation with cells acquiring polygonal-shape. Scale bar = 100 µm. Please click here to view a larger version of this figure. Figure 2: Assessment of HLCs well-to-well variability. (A) Representation of a 96 well plate view of HLCs stained with DAPI. Scale bar = 1 mm. (B) Quantification of cell number per well. 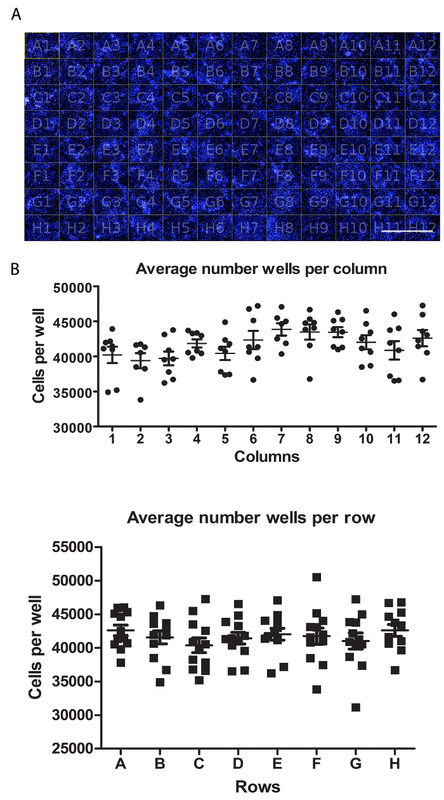 Average of cell number per wells in columns (top) and rows (bottom), from seven fields of views per well and quantified using Columbus software. Average cell number across the plate is 41,662 ± 3,366 SEM cells per well. No statistically significant differences were observed between wells. A One-way ANOVA with Tukey's post-hoc statistical tests was employed. Please click here to view a larger version of this figure. Figure 3: Hepatocyte marker expression and CYP P450 activity measurement in HLCs at day 18. (A) The percentage of hepatocyte nuclear factor 4 alpha (HNF4α) expression ± SEM is based on thirty wells with ten fields of view per well. (B) The percentage of albumin (ALB) expression +/- SEM, is based on 3 separate wells with ten fields of view per well. (C) The percentage of alpha fetoprotein (AFP) +/- SEM is based on 3 separate wells with ten fields of view per well. (D) E-cadherin staining. (E) CYP2D6 staining. (F) CYP3A4 staining. (G). Immunoglobulin G (IgG) staining control. Scale bar = 50 µm. (H) CYP P450 1A2 and 3A metabolic activity in HLCs at day 18. The data represents six biological replicates +/- SEM. Activity is quoted as relative light units (RLUs)/mL per 1 mg of protein. Please click here to view a larger version of this figure. Our semi-automated procedure is efficient, reliable and economical, allowing the production of HLCs at scale (Figure 1). There was not any significant difference in terms of the number of cells between the wells in the plate, making this platform a suitable approach for cell-based screening (Figure 2). In addition, the semi-automation workflow enables the user to produce large numbers of plates at once, which was not possible before using manual processes5,12. Importantly, the automation process did not impact on differentiation yields, with the majority of cells expressing HNF4α (89.2%±2) and ALB (92.8%±6) (Figure 3). HLCs also expressed CYP P450 enzymes CYP2D6 and CYP3A4 and displayed CYP1A2 and CYP3A metabolic activity comparable to previous reported experiments (Figure 3)5. Despite the standardization of the protocol, cell confluency prior to the differentiation is critical for pure HLC differentiation. Therefore, ensuring a good cell distribution across the well is an important consideration (Figure 1). This has proven to be cell line dependent, therefore cell seeding and density optimization is required for each cell line prior to scale-up. In its current form, this platform is not suitable to produce large quantities of HLCs for clinical applications, and this will most likely be achieved through the use of cell factories and bioreactors. However, the methodology developed does allow for the rapid generation of human liver cells for disease modelling, drug screening and/or drug repurposing studies. Moreover, the assay is amenable to multiplexing, permitting the generation of multiparametric datasets for mechanistic analysis. Going forward, we also believe that this technology could be applied to more complex in vitro systems such as 3D differentiation or as a platform to improve HLC phenotype in vitro. In conclusion, we believe that our simple and semi-automated system will increase experimental throughput, and reduce experimental variation, thereby improving the quality of biological datasets and their extrapolation toward human physiology. Prof. David C. Hay is a co-founder and director of Stemnovate Limited. Prof. David C. Hay is a director of HigherSteaks Limited. This work was supported with awards from the Chief Scientist's Office (TCS/16/37) and an MRC PhD scholarship.